It attaches to the back of a helmet and transmits data to a team medic. AS AWARENESS OF the danger concussion in sport grows, one innovative solution to spotting the injury as soon as it happens has been developed by an Irish student in Limerick. 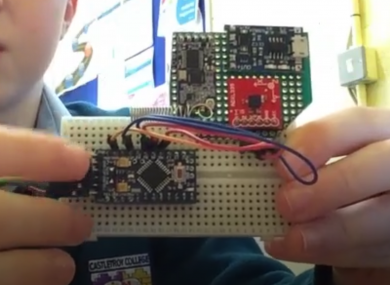 Liam O’Mara, a second year student from Castletroy College, is developing a device known as Hel-mate for the BT Young Scientist Competition. The small box would attach to the back of a helmet and identify impacts which cross a certain g-force threshold, alerting the team medic. How it works is simple: An accelerator measures the movement of the head during sport and a microprocessor interprets this data. This data – essentially how fast the head is moving – is sent to an iPad at pitch side. The medic can then call the player off for further examination if an impact causes the level of g-force above which is considered to possibly cause a concussion. The idea for the device came from Liam’s own experience in sport, when during a match he sustained a knock to the head. While it wasn’t severe enough to cause a concussion, it was enough to prompt him to think how he could be more sure of what happened. Liam is a Young Scientist veteran having entered last year with his brother, but is flying solo on his project. Ahead of the competition later this month he is fine-tuning the project. He believes he can make the device smaller and thus easier to fit on an helmet, and is 3D printing a new housing for it to fit into. Other issues, such as intermittent problem with the transmitter, are also being ironed out. He is also developing the code that will be used to power the pitch-side app. We’ll be checking in again with Liam ahead of the competition to see his progress. Email “This Young Scientist project could help spot concussion injuries during sport ”. Feedback on “This Young Scientist project could help spot concussion injuries during sport ”.